The Huawei P20 Leica triple camera module is coming in late March. Read more to know what revolutionary camera features Huawei is incorporating in the Android flagship P20 series. Huawei is credited with being the first tier-1 brand to incorporate the dual-camera setup in their flagship phones, before established players like Samsung, Apple or others embraced it in 2017. Now, the Chinese technology major is reportedly planning to take the camera feature another notch high with the Huawei P20 series. Popular tipster blog Slash Leaks has got hold of some never-seen-before Huawei P20 cover-case pictures and revealed that the device will house three Leica-branded rear cameras on the top-left corner and a dual-snapper on the front. The Leica tri-camera module is aligned vertically with dual-LED flash at the bottom. Though the thought of three shooters got us and many smartphone enthusiasts excited, there is no word on how the cameras will work other than the in-depth image capture (which is already achieved by dual cameras) and how well the image quality will be. But, we have come to learn that the total pixel count of all three snappers is 40MP and that the setup will be able to offer 5X hybrid zoom (optical and digital). It is said to boast Point Cloud Depth Camera, similar to Apple FaceID. And on the front, there will a 24MP dual-camera with wide angle Field Of View to assist in taking big group selfies. 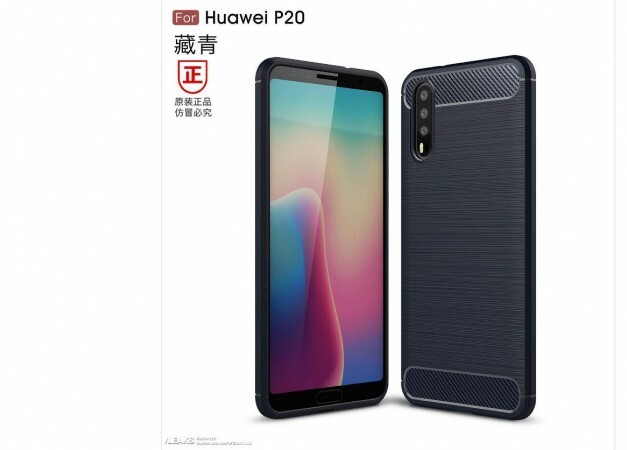 The leaked Huawei P20 case also sheds light on the front panel of the device; it is shown to feature an 18:9 aspect ratio display, which is now the new standard for flagship phones. Despite the having less bezel at the bottom, the company has managed to slip in a physical Home button, which also doubles as a biometric fingerprint sensor. The P20 is also expected to come with the company's proprietary 10nm-class HiSilicon Kirin 970 processor with a dedicated NPU (Neural-networking Processing Unit) co-processor. The former helps the phone independently analyse (artificial intelligence-based deep learning) user behaviour and assist them in completing a task, and also offer tips on how to make use of the best feature of the phone. In the long run, the device is less likely slow down, unlike other phones that seem to exhibit a lag in terms of response while loading apps. The NPU also enhances photo quality and battery life. Other internal hardware details of Huawei P20 are yet to ascertained, but leaks, as the aforementioned details, are expected to surface online till the phone makes its official debut, which by the way is said to be happening in late March. Huawei has confirmed that it will host a private product launch event at the iconic museum and exhibition hall, the Grand Palais, in Paris, France, on March 27. Stay tuned. Follow us @IBTimesIN_Tech on Twitter for latest updates on Huawei products.